Xiaomi has just lauched two affordable and budget friendly smartphones named Redmi Y1 and Redmi Y1 Lite ,and both phones comes with an awesome specs . The Xiaomi Redmi Y1 has a 5.5" LCD with Full HD resolution and a Snapdragon 435 chipset with an octa-center CPU timed at 1.4 GHz. There are two memory choices, the 3 GB RAM + 32 GB ROM or 4 GB RAM + 64 GB ROM. The phone runs MIUI 8 on Android Nougat 7.0. The Redmi Y1 comes with a 16-megapixel rear camera, with 76.4-degrees wide-point focal point, "Drove Selfie" light, and f/2.0 opening. and a 13-megapixel front camera and packed by a3080mAh battery capacity. Xiaomi Y1 3GB/32GB will be estimated at $140 (N50,400), 4GB/64GB variant will be priced at $170 (N61,200). Y1 Lite comes with a 5.5" LCD of 720p resolution. The selfie camera has a fairly essential 5 MP sensor, yet the fundamental one has 13 MP. The Redmi Y1 Lite is controlled by a lighter Qualcomm Snapdragon 425 processor, and comes with a 2GB of RAM alongside 16GB of inbuilt storage. 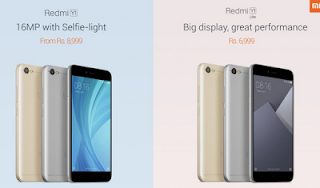 Xiaomi Redmi Y1 Lite cost about $108 (N38,880). Thanks no nothing is Bahd.